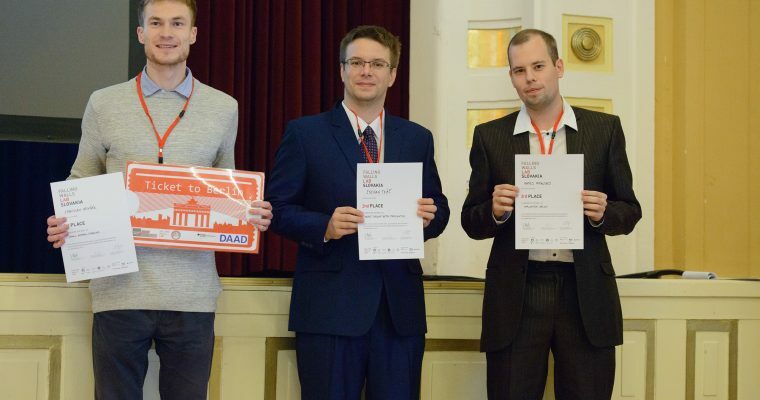 The first edition of the Falling Walls Lab Slovakia took place on September 29, 2017. In a beautiful Moyzes hall, the audience of more than 100 people had a privilege to hear 18 inspiring presentations of young innovators and researchers. The jury made of distinguished scientists and representatives of business sector had a tough task to select only one winner who will represent Slovakia at the world Falling Walls Lab finale in Berlin. The first place and a “ticket to Berlin” have been awarded to Stanislav Hrivnak from P. J. Safarik University in Kosice, for breaking the wall of small animal imaging. The 2nd place went to Stefan Tkac from Technical Unviersity of Kosice for breaking the wall of hydro turbine rotor stabilization, while the 3rd place went to Matej Mikulszky from Technical Unviersity of Kosice for breaking the wall of application design. Congratulations!